Dr. Giac Dang graduated at the top of his high school class in Dracut, MA in 2003. He earned a B.A. degree with honors from Tufts University and attended Tufts University School of Dental Medicine from 2007 to 2011. At Tufts Dental, Dr. Dang received multiple scholarships and honors, including recognition for his achievements on the national board examinations. 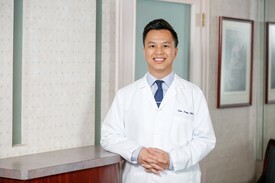 After receiving his Doctor of Dental Medicine degree in 2011, Dr. Dang decided to specialize in Periodontics to further his training on complex dental implant procedures, bone augmentation, and soft-tissue grafting techniques. He graduated in June of 2014 with a certificate in Periodontology from Tufts University and joined Chelmsford Perio in 2015. 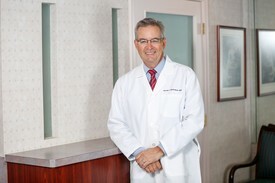 He is grateful to have joined a practice so close to home and to be collaborating with Dr. McPartland who shares similar philosophies in practice and patient care. As a specialist, Dr. Dang strives for perfection in his work (periodontal, regenerative, and implants) and loves interacting with and helping his patients. He is proud to be recognized as a Diplomate of the American Board of Periodontology. In his spare time, Dr. Dang is an avid supporter of local sports teams especially the Patriots. He also loves to spend quality time with his wife Tina and their daughter Madison.